This recipe was a winner and it's made entirely from ingredients that you will more than likely have on the ready in your kitchen. The dish is super quick and will save you from that lazy "it's Friday, I don't want to cook" visit to your Chinese restaurant. It's filling, surprisingly complex with flavors as well and you can serve it over noodles or spaghetti, if you like and let's face it, it'll save you some money because you will not be paying for a Friday night takeaway. You can of course you can simply use 300 grams of one type of mushroom for this recipe. I tried mixed mushrooms here simply to add to the taste and appearance. 1. In a large pan, warm the oil over a medium heat. 2. Add the onion, garlic and dried thyme with a little salt. Saute until onion is soft. 3. Add the mushrooms and wine. Cover pan and cook for 5 minutes. 4. 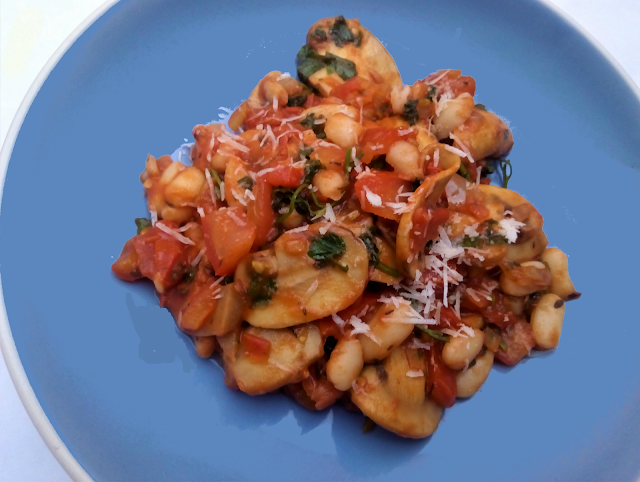 Add cannellini beans, chopped tomatoes and parsley. Simmer, stirring now and then until the juices have evaporated. 5. Salt and pepper to taste. Sprinkle over the grated Parmesan.